The climate flip has previously been linked to the demise of the North American “Clovis” people. Rapid climate change occurred 12,900 years ago, and it is proposed that this is associated with the extinction of large mammals such as the mammoth, widespread wildfires, and rapid changes in atmospheric and ocean circulation. All of these have previously been linked to a cosmic impact, but the theory has been hotly disputed due to lack of clear evidence. New platinum measurements were made on ice cores that allow conditions 13,000 years ago to be determined at a time resolution of better than five years, report Michail Petaev and colleagues from Harvard University. Their results are published in the journal Proceedings of the National Academy of Sciences. 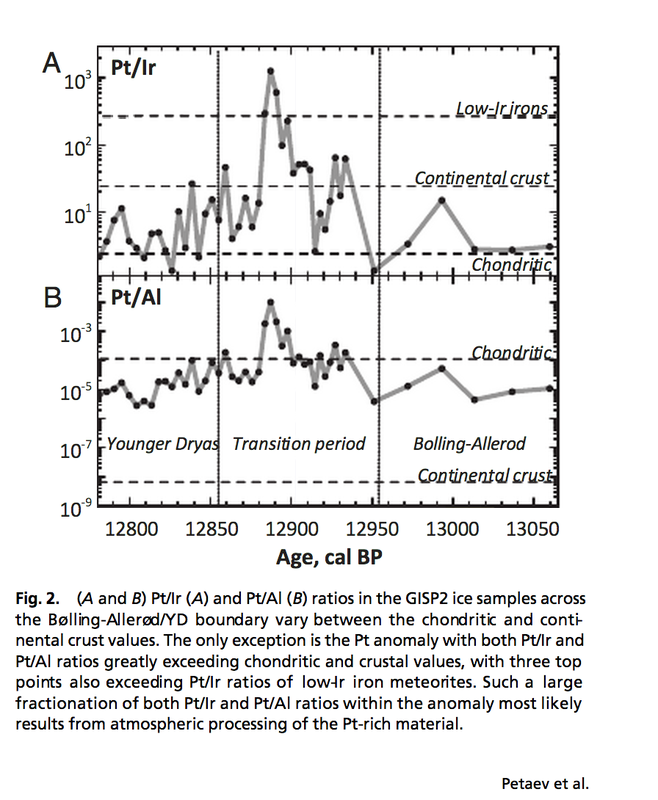 A 100-fold spike in platinum concentration occurs in ice that is around 12,890 years old, at just the same moment that rapid cooling of the climate is indicated from oxygen isotope measurements, at the start of a climatic period called the “Younger Dryas”. The Younger Dryas started and finished abruptly, and is one of a number of shorter periods of climate change that appear to have occurred since the last glacial maximum of 20,000 years ago. Each end of the Younger Dryas period may have involved very rapid changes in temperature as the climate system reached a tipping point, with suggestions that dramatic changes in temperature occurred over as short as timescale as a decade or so. Asteroid apocalypse?The observations lend credence to earlier, disputed, reports that finds of microscopic grains of diamond and a mineral called lonsdaleite in lake sediments dated to the same time were identified with a possible meteorite impact. Those measurements resemble the most recent observations of remnants of the Tunguska meteorite impact in Siberia, reported last month. Sphere-shaped particles have also been identified at many localities in sediments dating to this event, most recently reported this month by a team led from Canada in the Journal of Geology. Such particles are characteristic of the rapidly heated and cooled splatter of material thrown up when meteorites hit Earth. While the platinum data and the spherical particles add to evidence for an impact event, doubters have pointed out that, as yet, no impact site has been identified. It has been suggested that debris thrown into the atmosphere in an impact tipped the Earth into global cooling at a rate as rapid as the global changes in climate in the reverse direction seen in the last century. Such rapid climate change makes it difficult for ecologies and societies to adjust: It is the fluctuation that has been invoked as the cause of the extinction of massive mammals (megafauna) like the mammoth, and native cultures such as the Clovis people in North America. The possible role of cosmic impacts in causing huge changes to life on Earth is receiving increased attention. The mass extinction 66 million years ago that wiped out the dinosaurs is generally believed to be linked to a space strike in southern Mexico’s Yucatan Peninsula. Recently, a group of scientists led by Eric Tohver at the University of Western Australia reported that the biggest extinction of all, which occurred 252.3 million years ago at the end of the Permian period, could be explained by an asteroid impact in Brazil. Nasa is now focusing resources towards detection of future Earth-threatening asteroids, receiving over 400 responses to their recent request for ideas to feed into their Asteroid Grand Challenge, in which they hope to redirect a space rock and send humans to study it.